Basic Income is often promoted as an idea that will solve inequality and make people less dependent on capitalist employment. However, it will instead aggravate inequality and reduce social programs that benefit the majority of people. The reason many people on the left are excited about proposals such as universal basic income is that they acknowledges economic inequality and its social consequences. However, a closer look at how UBI is expected to work reveals that it is intended to provide political cover for the elimination of social programs and the privatization of social services. The Liberal Party's resolution is no exception. Calling for "Savings in health, justice, education and social welfare as well as the building of self-reliant, taxpaying citizen," clearly means social cuts and privatization. UBI has been endorsed by neoliberal economists for a long time. One of its early champions was the patron saint of neoliberalism, Milton Friedman. In his book Capitalism and Freedom, Friedman argues for a “negative income tax” as a means to deliver a basic income. After arguing that private charity is the best way to alleviate poverty, and praising the "private ... organizations and institutions" that delivered charity for the poor in the capitalist heyday of the nineteenth century, Friedman blames social programs for the disappearance of private charities: "One of the major costs of the extension of governmental welfare activities has been the corresponding decline in private charitable activities." To Friedman and his many powerful followers, the cause of poverty is not enough capitalism. Thus, their solution is to provide a "basic income" as a means to eliminate social programs and replace them with private organizations. Friedman specifically argues that "if enacted as a substitute for the present rag bag of measures directed at the same end, the total administrative burden would surely be reduced." Friedman goes on to list some the "rag bag" of measures he would hope to eliminate: direct welfare payments and programs of all kinds, old age assistance, social security, aid to dependent children, public housing, veterans' benefits, minimum-wage laws, and public health programs, hospitals and mental institutions. Friedman also spends a few paragraphs worrying whether people who depend on "Basic Income" should have the right to vote, since politically enfranchised dependents could vote for more money and services at the expense of those who do not depend on these. Using the example of pension recipients in the United Kingdom, he concludes that they "have not destroyed, at least as yet, Britain's liberties or its predominantly capitalistic system." Charles Murray, another prominent libertarian promoter of UBI, shares Friedman's views. In an interview with PBS, he said: "America’s always been very good at providing help to people in need. It hasn’t been perfect, but they’ve been very good at it. Those relationships have been undercut in recent years by a welfare state that has, in my view, denuded the civic culture." Like Friedman, Murray blames the welfare state for the loss of apparently effective private charity. Murray adds: "The first rule is that the basic guaranteed income has to replace everything else — it’s not an add-on. So there’s no more food stamps; there’s no more Medicaid; you just go down the whole list. None of that’s left. The government gives money; other human needs are dealt with by other human beings in the neighborhood, in the community, in the organizations. I think that’s great." To the Cato Institute, the elimination of social programs is a part of the meaning of Universal Income. In an article about the Finish pilot project, the Institute defines UBI as “scrapping the existing welfare system and distributing the same cash benefit to every adult citizen without additional strings or eligibility criteria”. And in fact, the options being considered by Finland are constrained to limiting the amount of the basic income to the savings from the programs it would replace. From a social welfare point of view, the substitution of social programs with market-based and charitable provision of everything from health to housing, from child support to old-age assistance, clearly creates a multi-tier system in which the poorest may be able to afford some housing and health care, but clearly much less than the rich — most importantly, with no guarantee that the income will be sufficient for their actual need for health care, child care, education, housing, and other needs, which would be available only by way of for-profit markets and private charities. Looking specifically at the question of whether Friedman's proposal would actually improve the conditions of the poor, Hyman A. Minsky, himself a renowned and highly regarded economist, wrote the "The Macroeconomics of a Negative Income Tax." Minsky looks at the outcome of a "social dividend," which "transfers to every person alive, rich or poor, working or unemployed, young or old, a designated money income by right." Minsky conclusively shows that such a program would "be inflationary even if budgets are balanced" and that the "rise in prices will erode the real value of benefits to the poor ... and may impose unintended real costs upon families with modest incomes." This means that any improved spending power afforded to citizens through an instrument such as UBI will be completely absorbed by higher prices for necessities. Rather than alleviating poverty, UBI will most likely exacerbate it. The core reasoning is quite simple: the prices that people pay for housing and other necessities are derived from how much they can afford to pay in the first place. If you imagine they way housing is distributed in a modern capitalist society, the poorest get the worst housing, and the richest get the best. Giving everyone in the community, rich and poor alike, more money, would not allow the poorest to get better housing, it would just raise the price of housing. If UBI came at the expense of other social programs, such as health care or child care, as Friedman intended, then the rising cost of housing would draw money away from other previously socially provisioned services, forcing families with modest incomes to improve their substandard housing by accepting worse or less childcare or healthcare, or vice versa. A disabled person whose mobility needs requires additional expenditure on accessible housing may not have enough of the basic income left for any additional health care they also require. Yet replacing means testing and special programs that address specific needs is the big idea of UBI. The notion that we can solve inequality within capitalism by indiscriminately giving people money and leaving the provisioning of all social needs to corporations is extremely dubious. While this view is to be expected among those, like Murray and Friedman, who promote capitalism, it is not compatible with anticapitalism. UBI will end up in the hands of capitalists. We will be dependent on these same capitalists for everything we need. But to truly alleviate poverty, productive capacity must be directed toward creating real value for society and not toward "maximizing shareholder value" of profit-seeking investors. Many people don't dispute the fact that establishment promoters of UBI are only doing it in order to eliminate social programs, but they imagine that another kind of basic income is possible. They call for a basic income that disregards the “deal” that Charles Murray advocates, but want UBI in addition to other social program, including means-tested benefits, protections for housing, guarantees of education and child care, and so on.This view ignores the political dimension of the question. Proposing UBI in addition to existing program mistakes, a general consensus for replacing social programs with a guaranteed income for a broad base of support for increasing social programs. But, no such broad base exists. Writing in 1943, with the wartime policies of "full employment" enjoying wide support, Michal Kalecki wrote a remarkable essay entitled "The Political Aspects of Full Employment." Kalecki opens by writing, "a solid majority of economists is now of the opinion that, even in a capitalist system, full employment may be secured by a government spending programme." Though he is talking about full employment, which means an "adequate plan to employ all existing labour power," the same is true of UBI. The majority of economists would agree that a plan to guarantee an income for all is possible. Business leaders fight tooth and nail against any increase of social benefits for workers. Under their dominion, only one kind of UBI is possible: the one supported by Friedman and Murray, the Canadian Liberal Party, and all others who want to subject workers to bosses. The UBI will be under constant attack, and unlike established social programs with planned outcomes that are socially entrenched and difficult to eliminate, UBI is just a number, one that can be reduced, eliminated, or simply allowed to fall behind inflation. 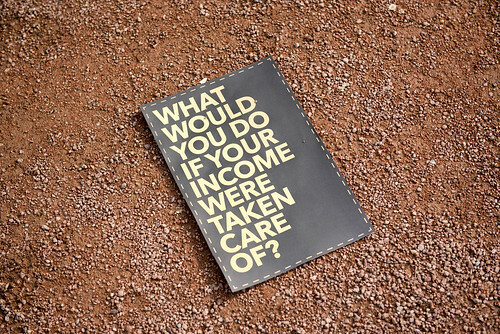 UBI does not alleviate poverty and turns social necessities into products for profit. To truly address inequality we need adequate social provisioning. If we want to reduce means testing and dependency on capitalist employment, we can do so with capacity planning. Our political demands should mandate sufficient housing, healthcare, education, childcare and all basic human necessities for all. Rather than a basic income, we need to demand and fight for a basic outcome — for the right to life and justice, not just the right to spend. favourite word of programmers: "it *should* work ..."